Third-party restaurant delivery has opened up the eyes and wallets of restaurateurs, tech investors and hungry consumers. Several years into this dinner-on-demand revolution, catering has emerged as an adjacent option to give restaurants another avenue for adding incremental sales and revenue. 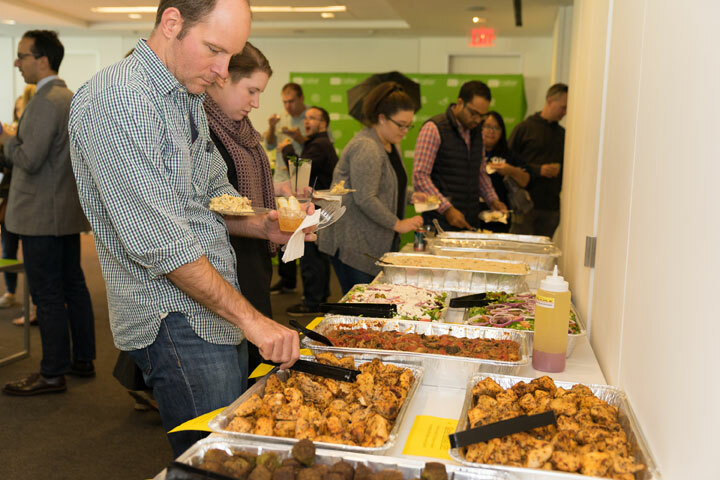 ezCater is one of several brands looking to cash in on the catering craze, and with a recent $100 million investment into the company, expect to see a big push to position catering as an increasingly important trend in the U.S. restaurant scene. Jim Rand, ezCater’s catering practice leader, went as far as telling me “catering is the new black.” After attracting an additional $100 million in investor cash in June, the Boston-based company’s war chest has swelled to $170 million, so when this 35+-year restaurant veteran says we’ll be seeing and hearing more about workplace catering in the near future, I’m inclined to agree. Before Panera Bread was a household name, Rand was a partner in a Panera franchisee group that grew to 27 locations. Spotting an opportunity to grow his business with catering, before the company had its own in-house catering program, he devised a slimmed-down catering menu, hired sales staff and built a top-to-bottom catering platform for his locations that was wildly successful. He raised enough eyebrows that Panera later brought him in-house as its vice president of catering from 2007 to 2016. After building the company-wide catering platform to scale, he left for PF Chang’s, where he helped the lettuce-wrap champs start their own catering program. Since joining ezCater at the start of 2018, Rand’s job is dedicated to connecting restaurants that desire a new revenue stream with corporate and individual customers desiring catering options beyond the institutional choices like Aramark and Sodexo. Before the investment windfall was announced, ezCater had broadened its product offerings to include ezOrdering, a service enabling restaurants to take online catering orders from their own website; ezManage, which allows them to manage and understand their catering orders, and ezDispatch, which connects them to delivery companies within their territories. Stefania Mallett, ezCater’s co-founder and CEO, said the brand has doubled its annual revenue for the last six years, and that part of the company’s new focus will include international expansion. Aleksanyan said putting together orders for 50, 100 or even 200 people at a time is easier than it may sound, unless it includes an unusual number of special requests. He added that catering orders give other people in the surrounding area the chance to try his food, who normally wouldn’t due to its location in the city’s congested downtown district. Flame Cafe also works with several third-party delivery services, but Aleksanyan said none of them reach “even 10 percent” of what the restaurant does through ezCater in a given month. While some of those catering orders are for residential customers, the vast majority are for corporate events and office deliveries. When it first started its catering program, Flame Cafe set a $300 minimum order, but has since reduced that threshold to $150 because experience has shown that smaller orders tend to result in larger orders from the same customers. Aleksanyan doesn’t use the ezDispatch delivery service, choosing instead to train its in-house delivery drivers, supplemented by third-party drivers when the restaurant is shorthanded. Because Flame Cafe is part of its Preferred Caterer Program that offers rewards points for repeat customers, ezCater charges the restaurant 20 to 25 percent of each order, which is higher than its standard, baseline fee of 15 percent. Speaking about catering more broadly, Aleksanyan said orders coming in at all hours can create challenges. He also said ensuring all members of large groups have a good experience can be stressful.